On hold until we can get the schematic checked out. Buffer into gain stage into buffer means that at least circuit-wise it's nothing like a Klon, but definitely worth a build. It dishes out a superb blend of light overdrives that enhance, without changing, the sound of your amp. A unique "Pre-Bass control eliminates problems with too much fuzzy bass, or the opposite problem of being a weak, thin-sounding overdrive. Drive and level controls offer further shaping options. It's like having an entire arsenal of overdrive pedals in just one box. Add an entirely new dimension to your amp with a maximum 30dB of gain without overprocessing. I wish I new how to shape tone in these circuits. I just follow the instructions. Like my wife cooking. If their is no recipe then we will starve. For the first five years of our marriage it was Mac and cheese or nothing. Luckily, i love Mac and cheese. I agree with you on this.. Maybe someone can do a tutorial on biasing transistors or something like that.. I'm new to this also and would love to see something along those lines. That article has some really good pointers about opamps and how to use them. There are practically two ways. Inverting and non-inverting. There's really good info about bi-polar and bias power supplies for opamps too. Also. Google is your friend in these matters. There are tons and tons of articles if you have the time and want to put in the effort. Some may go too deep, but some of them are good to get the hang of the basics. Thanks for all the info Mirosol... I will definitely block out some time this week to get some reading done. I appreciate your time and will use it to good use. Now back to the builds at hand! are the whitecentered blue circles on the layout for jumper links? yes. they are a shared jumper link hole..one end of both jumper links being squeezed into one hole. hope this helps.. The people on the forums (as well as this site) are very free with information. And they don't seem to get annoyed when I ask the same question over and over. Well, their annoyance doesn't come through in the message, anyway. The nice thing about this hobby is how economical it is. I occasionally learn with the "I wonder what will happen if I do this" method. When it blows up, I am out maybe $3. Usually less than a dollar. But I know what happens when you do that, and once in a while it does something that's actually useful. Have fun with it. Hey, love your site and i am learning so much here. But i can't seem to find any way to donate to this site. I could posibly post a schematic or vero if I have something others might be interested in. Or is there a donation spot on your site? A members contribution page would be cool, I've got a few layouts I could share, deffo helps the learning process, I do think it would lessen stress levels if members only post layouts they've verified and schematics they know to be correct tho'. I click by brians out on here. So hope that helps. I do appricate all the work you've put in for the site. Sure all others agree. If you do decide to put up a members layout page, I'll try to put together a couple things. It'll make me work to learn more about design and layout. Thanks again. I'm leaning towards schematic being in fault. I get unity out with no drive or clipping at all. When all pots are maxed that is. Pre-Bass and volume seem to be working.. Is the schem from Jonas or from the german PDF? Someone mentioned, that this circuit doesn't take too kindly to JFET input opamps, so i tried it out with HA17458 - that didn't change a thing. I'll put this on hold in the meantime because it certainly appears that something is amiss with the scheme. Bummer. I want one of these pretty badly. I keep getting beat out on the FleaBay auctions. I'm a Country player and I think it'd be an awesome C&W OD. I was really happy when I saw this layout, so I made a big Tayda order. Before my goodies got here I saw where this layout doesn't work. Ha! Great! Just hold off on it a while and build any other project you have on first. I'll try to find out what the issue is with the schematic. I've had a look at this, at the MarkM PCB layout and the other vero and have a few things for anyone who has built this to try. 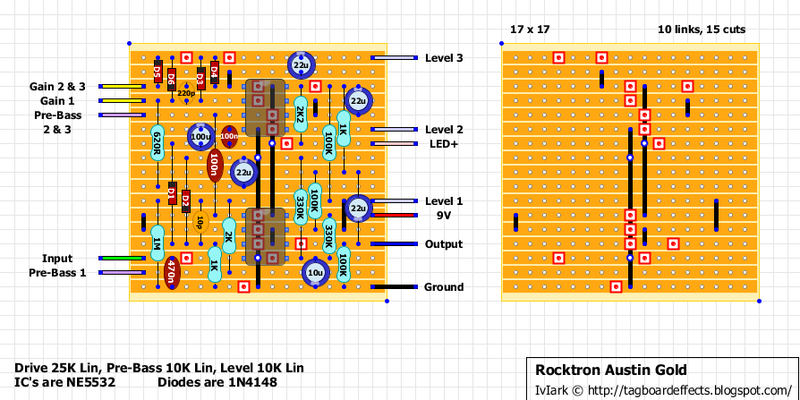 Firstly there seems to be errors on both the PCB layout (diode orientation) and the vero layout (R13 between 9V and ground isn't right, probably should be between 4.5V rail and ground), so I don't know if either have ever been built and corrected. But these are things that have cropped up. 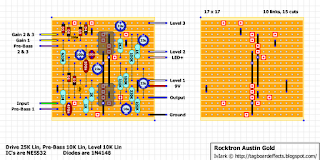 Firstly when doing the layout from the schematic I've followed it verbatim even when something seemed peculiar, specifically the 620R > 22u to ground with the positive leg of the cap going to ground. Thinking about it more logically there are no negative voltages in this pedal like you have in the Klon for instance and so that definitely doesn't make sense, so the first thing I would suggest trying is swapping the leads of the cap and see if that fixes things. 1) 1M from 470n and 1K junction connects to IC pin 3 from 4.5V rail. 2) 10p at pin 3 goes to ground, not 4.5V. If someone could give those a shot and let me know if it fixes things, if not I'll try and dig a bit deeper. Tag. Reversing (and replacing) that 22µ did it. Not bad. John might want to open up some lower frequencies, but basically this is really great alternative for TS-series. I got it just an inch colder with JRC4558s, that i found to be to my linking. Nice OD. Wondering if anyone's got a good overdrive out of this? Built it up and it works... Volume and Pre-Bass work as expected. But at max gain, there's very, very little clipping. There is some OD happening, but it's nothing like that demo video (I understand the Golden Drive isn't exactly the Austin Gold). Just wondering if sticking with that 620R and the 25K Lin for Drive has been working for others. Maybe I've just got a bad diode in there or something. Very nice Overdrive! More transparent than TS serie and it can be a beautiful-powerful booster when used at low gain.The layout is confirmed and verified.